If you decide to make your own mini-pie shapes: on a surface covered with flour, roll out your pie crust. Cut out 2-inch circles (with a cookie cutter or drinking glass) of the rolled-out dough and place each pie circle in a muffin tin. In a medium-sized bowl, mix blueberries, cornstarch, sugar, and lemon. 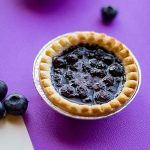 Fill each pie crust with your blueberry mixture and dot it with small pats of butter. Bake for about 15 to 18 minutes or until pie crust is golden. Allow the pies to cool completely before taking them out of the muffin tin.